Where do I find the download button for downloading the Adobe Captivate 2019 software? I have paid for my renewal, and have signed in, but no “download here” button is to be easily found. I was hoping the process would be far more intuitive, but cannot find it. Hi, Sorry about that, we will look into this. Sorry, but the link download the 2017 version. Alternative? 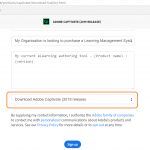 When you navigate to the link, https://www.adobe.com/products/captivate/download-trial/try.html , it ask for the org details and bottom you can see “Download Adobe Captivate (2019 release)”, select the platform and language. Click Sign up to download the selected version. Please refer to the attached image.